The Société de Développement Commercial – Les Quartiers du Canal and PME MTL Grand Sud-Ouest are proud to present the I am local and I am available contest to entrepreneurs. From August 30, 2018 to March 15, 2019, vacant spaces on Notre Dame Street West in Saint-Henri will be looking to seduce entrepreneurs. Along with the keys, grants ranging from $ 15,000 to $ 35,000 will go to the entrepreneurs who win the heart of a local space. Notre Dame Street West is a well-known commercial artery that underwent eleven months of work in 2017 (aqueduct, surface and electricity network refurbishment) between Atwater Avenue and St. Augustine Street. With a gorgeous new lease on life, the street is now committed to attracting entrepreneurs in a game of seduction. In the I am local and I am available contest, entrepreneurs will select the premises with which they wish to engage. But be warned, only serious suitors need apply. The local spaces will have signs in their windows to let potential soul mates know what they are looking for. Number 3436 Notre-Dame West will say: "I’ve been around the block a few times, but now I’m looking for a deeper connection. How about you?” while next door will charmingly ask: "Do you believe in love at first sight, or should I come back later?" On the picture, from left to right: Mr. Éric Prud'Homme, General Manager, Desjardins Business West of Montreal, Ms. Christiane Oligny, Executive Director of Caisse Desjardins du Sud-Ouest de Montréal, Ms. Marie-Claude Dauray, Executive Director PME MTL Grand Sud-Ouest, Mr. Jean-Michel Gadoua, President of SDC-Les Quartiers du Canal, Mr. Benoît Dorais, Mayor of the Sud-Ouest Borough and President of the Executive Committee as well as Mr. Robert Beaudry, member of the executive committee responsible for economic and commercial development. "Notre-Dame Street West and all our commercial streets in Little Burgundy and Saint-Henri have real commercial appeal, with a vacancy rate of only 4% and more specifically 7.28% for the area covered by this contest,” stated Jean-Michel Gadoua, President of SDC – Les Quartiers du Canal. “In addition, the pending arrival of a number of new businesses demonstrates real economic momentum. We hope that I am local and I am available contest will reinforce this attraction by giving new entrepreneurs the opportunity to enjoy the excitement of our business destination," he said. 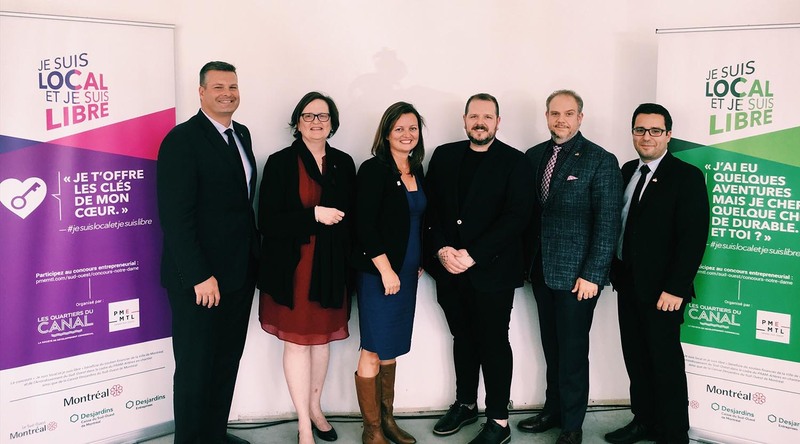 "This humorous campaign is a reflection of the dynamism and vitality we want to breathe into this newly renovated artery,” said Benoit Dorais, Sud-Ouest Borough Mayor and Chair of the Executive Committee of the City of Montréal. “Wouldn’t you like a space on a street where you can grow your business in a stimulating environment? This contest opens the door to renewal, creativity and innovation starting today," he added. "Local commerce plays a fundamental role in the vitality of neighbourhoods and the quality of life of Montrealers,” affirmed Robert Beaudry, Member of the City of Montréal Executive Committee and responsible for economic and commercial development and government relations. “We are therefore pleased to provide $100,000 in support of the PR@M-Artère project under way for Notre-Dame Street, to allow the establishment of new businesses that meet consumer needs for local customers and for the sector," he said. Entrepreneurs burning with desire to start a business on Notre-Dame Street West will have until March 15, 2019 to submit their entrepreneurial project at pmemtl.com/sud-ouest/concours-notre-dame. As stated by Marie-Claude Dauray, General Manager of PME MTL Grand Sud-Ouest "PME MTL Grand Sud-Ouest is proud to support local entrepreneurship and to help increase the commercial offer on an important artery for the sector. This initiative also contributes to enhancing living environments and making our area attractive to innovative industries." The I am local and I am available contest has financial support from the City of Montréal and the Sud-Ouest borough as part of the PR@M-Artères project, as well as from Caisse Desjardins du Sud-Ouest de Montréal.